"Aoi" redirects here. For other uses, see Aoi (disambiguation). "Blue Angel" redirects here. For the book, see Blue Angel (book). I just want my brother to know that I can hold on my own. Skye Zaizen, known as Aoi Zaizen (財（ざい）前（ぜん） 葵（あおい）, Zaizen Aoi) in the Japanese version, is a character appearing in the Yu-Gi-Oh! VRAINS anime. 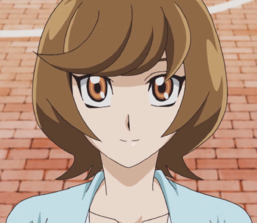 She is Yusaku Fujiki's classmate and the younger step-sister of Akira Zaizen. In LINK VRAINS, she is a popular Celebrity Duelist under the alias Blue Angel (ブルーエンジェル, Burū Enjeru). During the second season, Skye allies with Emma Bessho, taking up the alias of Blue Girl in New LINK VRAINS. After allying herself with Aqua and the other Ignis, Skye later changes her LINK VRAINS' alias to Blue Maiden. Skye is a fair-skinned young woman with light brown hair in a bob-cut and yellow eyes. Her standard attire is the Den City High School girls uniform that consists of a slate-colored jacket with a light blue trim, which she wears over a light yellow jumper. Underneath, she has a white dress shirt with a blue tie and heart-shaped clip. Skye's uniform also includes a short black skirt with black socks that reach below her knee and brown shoes. In the dub, she wears tights instead of socks. When she was younger, Skye would wear a yellow dress with a green shirt underneath. Her hair was styled similarly to her Blue Angel persona. Skye also carried a doll of "Evilswarm Mandragora". At home, Skye's casual clothes include a blue and white t-shirt with pink accents, light blue shorts, and baby blue slippers. Skye's first and second Avatars; Blue Angel and Blue Girl. As Blue Angel she takes on a appearance of magical girl, true to her name, she has very long blue hair with aquamarine highlights which reaches her chest and is tied into two long strands with blue ribbons. Her eyes and eyebrows are also blue and she has a green clover tattoo on her right cheek. She wears a blue choker and pink heart-shaped winged earrings. Her outfit consists of a white sleeveless shirt with a blue necktie. 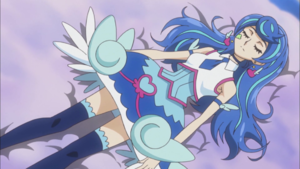 Underneath, she wears a blue and pink dress with wing-shaped frills, and dark blue thigh-high socks. She wears dark and light blue boots with wings attached to each one. Lastly, she has a pair of white wings with pink heart-shaped and lavender clover-shaped patterns on each wing. When she uses her Skill, "Trickstar Trick", the pink pars of her outfit glow. As Blue Girl, she wears a more form-fitting and practical outfit and she clips her hair back with a pink clover-shaped clip, leaving four long bangs hanging over her left eye. 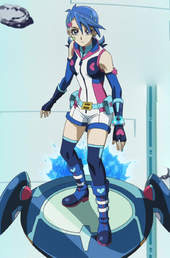 She wears a predominantly white one-piece garment that is white across the shoulders and down her front, dark blue with sideways pink hearts over each side of her chest, and pink at her ribs and in the interior, with a blue strip separating the pink and darker blue at her sides and blue cuffs at her legs. She wears an aquamarine sleeveless top below this with a pink clover tab; both of her tops are fastened with dark blue zippers. Blue Girl also wears long blue sleeves that reach to just under her arms with pink clover symbols at the tops, and darker blue finger-less gloves over them with aquamarine cuffs that reach mid-forearm and have pink heart symbols on the back of the hand. Similarly, she wears dark blue leggings with aquamarine cuffs that reach to mid-thigh under mid-calf length blue boots with pink soles, dark blue toes, and white straps, with aquamarine heart symbols on the cuffs. She accessorizes with an aquamarine belt that has twin Deck boxes at her hip and a golden buckle in the shape of a "B", blue heart-shaped ear studs; she retains her cheek tattoo. She uses a different Duel Disk and Duel Board that are less stylized than those she used as Blue Angel. When she uses her Skill, "Trickstar Gig", the pink symbols and cuffs of her outfit glow. Skye's third Avatar, Blue Maiden. As Blue Maiden, her hair lightens and lengthens again to the small of her back, becoming shot through with a darker blue and with a bang of pink. She wears a short dark blue dress with a white front, a blue collar, a pink section over her cleave pattern with blue drops, a lighter blue section below the white, and the front of her skirt is pink. Below her belt, the sides of her dress split away from the rest, with a lighter blue lining to the dark blue. She wears a golden belt with a pink, heart-shaped buckle, a thin blue choker, and leggings with a lighter blue section covering the top third of her thighs, a pink line separating it from a shade of dark blue, and lighter blue line separating that from a pink calf section. She also wears dark blue gauntlets with pink wrist cuffs and lighter blue elbow cuffs adorned with small wings, and boots in the same style. Her cheek tattoo becomes teardrop-shaped, she wears a black band set with a pink jewel in a manner resembling the Eye of Wdjat around her left bicep, and she wears pink earrings similar to those she wore as Blue Angel, but inverted and lacking the wings. Skye is described as being very nice, polite, timid, and reserved on first sight. As a child, based on a picture of her, she is a shy girl, holding onto her mother. However, as a Celebrity Duelist, Skye becomes very active in LINK VRAINS. 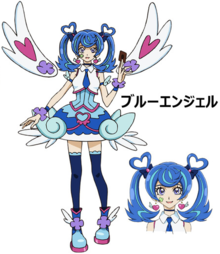 As Blue Angel, her personality is very bubbly, energetic and she is a smiling idol with a cheerful demeanor. She is very obedient to her older step-brother, Akira, but also wants to prove herself and is willing to show him that she can handle something on her own. She seems very distrustful of others, as she thinks most people only approach her for her connections to SOL Technologies. Despite this she is shown to be very grateful for people who have helped and saved her and she is also eager to help them in return. Skye was shown to get annoyed and angry when Emma lectured her. This carried on inside LINK VRAINS as Blue Angel said she was in a bad mood and felt like beating someone. When Blue Angel worked out that Baira was behind the virus which infected her, Blue Angel became more determined to beat her and said she couldn't forgive her. "Aoi" (葵) means "hollyhock", a plant associated with abundance and great fortune and was also the emblem of the Tokugawa family. "Aoi" may also be derived from (青い), a Japanese word for "blue", reflected by her alias, "Blue Angel". The characters that form "Zaizen" (財前) can be translated as "before wealth". Her first name in the dub, "Skye", also ties into her color theme of blue. In LINK VRAINS as Blue Angel she can summon and create a blue energy whip. In a Speed Duel, Blue Angel can use the Skill "Trickstar Trick", which allows her to discard a "Trickstar" monster during the opponent's turn in order to force them to draw until they have 3 cards in their hand. Blue Girl can use the Skill "Trickstar Gig", which sends cards from the top of her Deck to her Graveyard for each "Trickstar" monster her opponent controls and then add a "Trickstar" card from her Graveyard to her hand. Young Skye waits outside for Akira. Ten years prior to the story, Akira and Skye's parents were married, and the two became siblings. But on their way to an anniversary, their parents died in a car accident. This left Akira and Skye alone and their possessions were sold, including their manor. To provide a living for him and his sister, Akira often broke the law, but Skye made him happy, and Akira swore to protect her smile. Skye cried a lot for the disappearance of her parents, feeling alone and miserable. To cheer her up, Akira read her the story of "Blue Angel", which made Skye happier. This also motivated her to become a hero of LINK VRAINS as a Celebrity Duelist, under the alias of Blue Angel. Blue Angel saved by Playmaker. Blue Angel was preparing to face another Duelist in LINK VRAINS, but before she was able to begin the Duel, a Knight of Hanoi appeared and began attacking LINK VRAINS with his "Cracking Dragon". She fled from the Knight in fear, and was about to be attacked by "Cracking Dragon", but Playmaker arrived in time to save her. She then watched the Duel between Playmaker and the Knight, and when Playmaker fell from his Duel Board, she returned her debt to him by throwing him back his Duel Board with an energy whip she summoned. After Playmaker defeated the Knight she and The Gore approached him and challenged him to a Duel. He refused their challenge, claiming that he had no interest in either of them and left, much to their dismay. Akira refused to allow Skye to Speed Duel. Despite this, Blue Angel eventually participated in one, defeating another Duelist to the cheers of her fans. Afterwards, she logged out of LINK VRAINS and went to watch the sunset. When Skye went to the Duel Club the next day, they were joined by a new member, Yusaku Fujiki. Skye introduced herself to Yusaku, who asked about the new Duel Disk model everyone in the club used. Shima started bragging about how Akira had given them all the new Duel Disks, and Skye shot him a stern glare. Skye noticed that Yusaku's Duel Disk was a card-loading model, the same as Playmaker's. She asked to see Yusaku's Deck, and Yusaku handed it to her, a basic LIGHT Deck. After she looked at the cards, she politely handed it back with a word of thanks, but Shima snatched it up and started laughing at the cards. 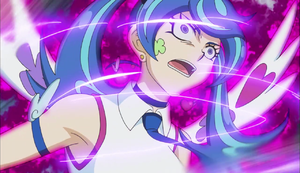 She looked on as the club's president scolded Shima for insulting the Deck, and Shima apologized and gave it back to Yusaku. After school, Skye returned to her apartment, and the housemaid robot there told her that Akira would not come home because of work. She turned on the TV and saw Akira deflecting press questions about Playmaker's Duel against The Gore. When he was asked if Blue Angel would Duel Playmaker next, he said no, prompting Skye to turn the TV off. Spectre throws the tainted card to Blue Angel. That evening, she got a call from Akira, who asked her why she was unhappy. Skye claimed that she wasn't, and Akira then told her to stop Speed Dueling because it was dangerous, in addition to warning her not to let anyone learn that she was Blue Angel, as it could jeopardize his position. She timidly replied that she understood and hung up, but reflected on her resolve to show him that she could hold her own, and she decided to Duel Playmaker. She entered LINK VRAINS and, after turning down several Duel requests, issued a public challenge to Playmaker to come out and Duel her. She waited in vain for Playmaker to show up, and was instead approached by Spectre, who claimed to be a fan of hers, but she realized he was lying. He told her he wanted her to defeat Playmaker, and gave her a card, which he told her would free her hidden desires. After he left, she wondered what she was doing there, apparently having no memory of the incident. She bumped into Yusaku again the next morning at school. As Skye and Yusaku walked to class, she asked him why he had joined the Duel Club, not believing it was because he loved Dueling. 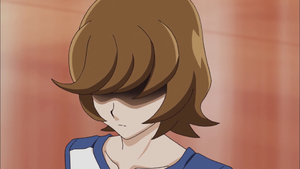 Yusaku asked her about her brother, and she angrily told him that people only ever talked to her because they wanted favors from her brother. She told him not to bother asking because her brother wouldn't trust her, and ran off. While Skye was in class, she received a text from Playmaker accepting her challenge. She excused herself, claiming she needed to go to the infirmary, but instead went to the rooftop to enter LINK VRAINS, though when she met up with Playmaker, he claimed that he hadn't challenged her. Nevertheless, he agreed to Duel Blue Angel, and as the Duel started, she felt a wave of excitement when she heard her fans cheering her on. Blue Angel started off splendidly, chipping away at a considerable amount of Playmaker's LP and destroying "Decode Talker" despite his attempts at defense. However, when Blue Angel drew "Dark Angel", she began to fall under the influence of the Knights of Hanoi. Playmaker took advantage of her continued attacks on his LP, allowing him to use his "Storm Access" Skill, bringing out "Encode Talker". As he prepared to attack, Blue Angel used her Skill in tandem with her cards to attempt to defeat Playmaker, but was foiled. She was forced to use "Dark Angel", infecting her with a virus created by the Knights of Hanoi that caused her to go berserk, screaming in agony. Playmaker managed to defeat her in a single attack, just as she lost consciousness from the mental damage she had received. After the Duel, Blue Angel fell into a coma. Playmaker caught her and made sure she was okay before he logged out. Yusaku Fujiki found the comatose Skye on the roof of the school, calling the paramedics, who rushed her to the hospital. The doctors were unable to identify the reason or cure for Skye's condition. Blue Angel remained unconscious within LINK VRAINS, and after disguising herself as her, Ghost Gal captured Playmaker and brought him to Blue Angel, as Akira tortured Playmaker for the cure. Varis, the leader of the Knights of Hanoi who had controlled Blue Angel, arrived, claiming responsibility for Blue Angel's condition and that he had an antivirus for her condition, which he would only relinquish if Playmaker defeated him in a Duel. With Skye's fate dependent on Playmaker's victory over Varis, Akira remained by his sister's avatar, lamenting that he couldn't protect her. Playmaker uses the virus-removal program on Blue Angel. Skye wakes up from her coma. Playmaker was able to defeat Varis, who relinquished the program needed to remove the virus from her. Playmaker returned to the church, approached Blue Angel's avatar and released the program, causing her to disappear as she logged out. Akira came to Skye's bed at the hospital, and watched as she woke up from her coma. Skye apologized for her actions, but Akira just asked her to rest, weeping tears of joy, and Skye smiled, seeing how much her brother cared for her. Blue Angel winks at her victory. Following the incident in LINK VRAINS, Akira prevented Skye from going to school or entering LINK VRAINS in an attempt to protect her. She took her tablet and accessed LINK VRAINS in the shape of a butterfly. She overheard the conversation between Ghost Gal and Akira. After Akira logged off, Ghost Gal recognized the butterfly as Blue Angel, and offered her a chance to regain her reputation. She logged into LINK VRAINS and used her energy whip to stop Prototype Red-B. She swore that she would be the one to defeat Playmaker, and ordered the AI to stop its attack. The AI prototype vowed to eliminate her too, and Blue Angel promised to take them on and defeat them. She explained that she had come to repay Playmaker for curing her. Playmaker claimed he never indebted her; regardless, Blue Angel started a Speed Duel with the Red-B. Blue Angel started with her usual tactics; assembling "Trickstar Light Stage", "Trickstar Holly Angel", "Trickstar Narkissus", and "Trickstar Lycoris", beginning to slowly sap its LP. To counter Blue Angel's strategy, the Red-B used "Abyss Invitation" to inflict 200 damage back to Blue Angel whenever Red-B was damaged. It Link Summoned "Tentacluster Nautilus", and used the effects of two "Tentacluster Blastsucker" to inflict a total of 1200 LP damage. Blue Angel noted that the prototype fought her using effect damage, and she would retaliate in a similar manner. Red-B brought Blue Angel's LP to 400, while it had 1500 LP left, then brought back a "Tentacluster Blastsucker", and attacked "Trickstar Lycoris", which Blue Angel noted would destroy "Blastsucker" on purpose and banish it to win the Duel. Blue Angel negated the attack, preventing the AI's victory. On her nest turn, Blue Angel Link Summoned "Trickstar Black Catbat", and her "Trickstar" Link Monsters defeated the AI prototype, banishing it. Blue Angel cheered and winked for her victory. Blue Angel shocked by Playmaker's story. She made it to the data bank and hid behind, seeing her brother and Ghost Gal confronting Playmaker. She learned that Akira had been demoted for helping her during Varis's attack, and of the illegal work he had done to provide for her in their youth. As Akira tried to persuade Playmaker to stand down, Blue Angel revealed herself, surprising Akira with her arrival. Blue Angel asked to know about Playmaker's past, admitting that she did not know what to Duel for, and felt this story would focus her on continuing forward. Blue Angel listened in shock as Akira explained about the Lost Incident, originally known as the Hanoi Project, where six children underwent cruel experiments. She was also shocked to hear that SOL Technologies' data bank contained the name of the mastermind behind the Project. Blue Angel was amazed to see Playmaker turn the Duel around with one card. "Firewall Dragon" attacked "Tindangle Acute Cerberus", and Blue Angel rushed to her brother to protect him, but he took the attack himself and collapsed in defeat. Akira saw he could not do anything to stop Playmaker, but Blue Angel corrected him, as she knew what Akira was feeling. She noted nobody would stand up to Playmaker, and nobody would prevent her brother from protecting her. Blue Angel makes a pact with Playmaker and The Gore. Skye is split at either staying home or joining the fight. Skye watched the Gore battle Dr. Genome, and even logged in to LINK VRAINS. After Gore won, Blue Angel joined his and Playmaker's alliance to stop the Knights of Hanoi. At school, Skye joined the Duel Club, where Shima voiced his concern of the Knights of Hanoi destroying LINK VRAINS. Hosoda forbade Shima or anyone else to fight the Knights of Hanoi, or else he'd regret that. Thus, he disbanded the club until the problem was solved, and Skye shushed Shima from protesting. Skye left, but listened how Shima boasted about Playmaker fighting the Knights of Hanoi. At evening, Skye and Akira ate dinner, since the latter could come back from work earlier due to his demotion. Skye gloated, making Akira believe she did not like that. Seeing Kitamura developed the AI army to confront the Knights of Hanoi, Akira reminded them unlike Skye, the AI-s could not be turned into the Deleted, and forbade her to enter LINK VRAINS. Skye was sad, but accepted Akira's demand. The two watched as Kitamura's AI army battled the Knights of Hanoi, but lost to two of elite members. Akira left to work, while Skye wondered if she should join her friends in the fight, or to stay outside under Akira's protection. After leaving school, Skye heard some male students wondering why Blue Angel hasn't shown up in LINK VRAINS for a long time. She was then approached by Emma Bessho who wanted to talk to her but Skye ignores her until the latter recognizes her as Blue Angel. Skye then recognizes Emma as Ghost Gal, who asked her if she was done being Blue Angel and learned many people are waiting for her to show up in LINK VRAINS. Skye then claim it is an exaggeration and she only fights for herself and not for others. Emma then reminded her the reason she became Blue Angel was because she wanted to gain her brother's attention and doesn't need Blue Angel anymore after realizing that Akira loves her. Emma then told Skye its better she stop being Blue Angel unless she is not committed to her work and encourage her to do things that will make her happy and then left. 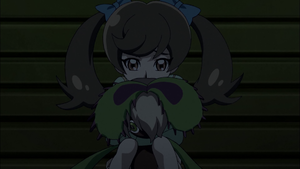 Skye then returned to home after the conversation with Emma and got furious and felt insulted on what Emma told her wondering who is she to give lecture on her and decided to log in to LINK VRAINS. Blue Angel proceeds to Link Summon, Dueling against Baira. When Baira was about to turn Frog and Pigeon into Deleted, Blue Angel showed up and aggressively challenges Baira to a Duel, stating she was in a very bad mood. 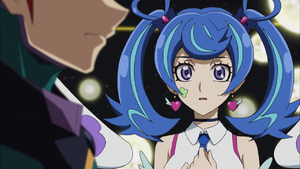 When a surprised Baira thought Blue Angel would never show up in LINK VRAINS, Blue Angel angrily questioned her is she going to give lecture to her. When Blue Angel learned she was used as a test subject to create the Deleted virus and Baria as its creator, she became furious and vowed to defeat her. 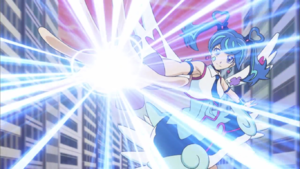 The two Speed Dueled with Blue Angel activating "Trickstar Light Stage", adding "Trickstar Lilybell" to her hand and activates its effect to Special Summon it. She then Normal Summons "Trickstar Nightshade" and Link Summon "Trickstar Holly Angel". As "Nightshade" was used as a Link Material for the Link Summon of a "Trickstar" monster, Blue Angel activates its effect, Special Summoning it from the Graveyard. When Baira uses Current Corruption Virus, all of Blue Angel's monsters effects are negated and their ATK reduced to 0 for three turns. Skye raises a rare smile. Baira activated the effect of "Dark Mummy Surgical Forceps" which inflict 500 damage to Blue Angel. As Baira summoned "Surgical Forceps" which attacks "Holly Angel", Blue Angel activated the effect of "Trickstar Perennial", sending it to the GY to prevent "Holly Angel's" destruction. Blue Angel later drew "Trickstar Narkissus", and subsequently Normal Summon it to Link Summon "Trickstar Bella Madonna" and defeat Baira. After the duel, Baira approached her saying that she is back to LINK VRAINS. Blue Angel then told her all she did was defeat her and get her revenge on Baira, claiming she only fights for herself and was back only for today. Baira activated the removal program which cures the Deleted victims. She then told Blue Angel to look at the sky and both witness Deleted victims getting cured and logging out of LINK VRAINS. Blue Angel questioned her why did she activate the program. Baira claim that Blue Angel was able to change her heart and she may have fought for herself but can change those around her and encouraged her to carry hopes on others if she does she is fighting for everyone. The next day both Skye and Akira watch the news about the Deleted victims getting cured while they were eating breakfast. Skye felt guilty for disobeying Akira and attempt to apologize him for her actions but Akira was proud of her and praises her for saving the victims of Deleted. This made Skye genuinely happy and she gave a cheerful smile to Akira. When Yusaku and Kolter went to Kyoko Taki's apartment, who Dueled Blue Angel, a camera was filming them. Skye watched as an ominous tower appeared in LINK VRAINS, and wondered what was going on. Seeing avatars being absorbed, Skye realized these people could not log out. She watched Spectre erasing Kitamura, and the former threatened to do this to anyone that dared entering LINK VRAINS. 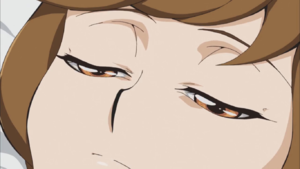 Being angry at him, Skye logged in LINK VRAINS. She quickly met up with the Gore and Playmaker. She was fighting for everyone, as those people look up to her. Go exclaimed the same, since he was the hero that needed to protect LINK VRAINS. Ai noted how full of energy Gore was. Gore noted that was the Ignis, who yelled out he had a name, Ai. Playmaker explained he came to stop the Tower of Hanoi, rescue Ghost Gal and confront the mastermind, Varis. Blue Angel was shocked to hear Ghost Gal vanished, too, at the hands of Varis. Gore asked about the data Ghost Gal gave to Playmaker, who reported Varis intended to destroy LINK VRAINS, using the tower. Blue Angel realized if the network would be destroyed, then all the people absorbed would be destroyed, too, hence why Playmaker exclaimed the importance of stopping the tower's completion, and Ai added it would prevent him from being erased. Gore asked how to stop the tower, and was told Varis had to be defeated. Ai warned the time limit was six hours before the tower was completed. Gore and Blue Angel promised to go there, but Playmaker replied it was better if they stayed home, in safety. This actually motivated Gore and Blue Angel to protect the children and the absorbed people, including Ghost Gal. Playmaker did not care, but asked of them to be careful. He reminded them one of them had to defeat Varis, who, according to Ghost Gal, wielded a powerful card. The trio promised to meet up against and went in different directions. She soon faced Spectre, who introduced himself, and told it was the second time they met. With a snap of his fingers, Spectre reminded Blue Angel of the incident, when he gave her "that card". Blue Angel accused him of giving her that computer virus, as Spectre noted he was "her fan". She demanded an explanation behind this, but Spectre refused to answer, thinking she would not understand, like combining hobbies and ideals. He exclaimed an idol like her would not understand his noble ideals. Since Varis ordered him to crush anyone that wanted to stop their plans, Spectre let Blue Angel escape. She refused, swearing to defeat him and Varis. Spectre thought a weakling like her could not defeat Varis, and promised a far worse fate than a computer virus should she lose, alerting her she would not be able to return to the real world. Blue Angel nevertheless promised to protect LINK VRAINS from the likes of him. The two initiated a Master Duel. Spectre Normal Summoned "Sunseed Genius Loci", and used it to Link Summon "Sunavalon Dryas". Spectre explained his monster could not be targeted for attacks. Blue Angel suspected there was more to it than that, while Spectre set a card. She asked about Ghost Gal's whereabouts, prompting Spectre to joke that he hoped he would be Ghost Gal's friend if she had a name like that. Blue Angel demanded a serious answer, as Spectre proclaimed Varis had defeated her, and was a part of Tower of Hanoi as data. He assured Blue Angel she would be a part of the tower, too. Blue Angel swore she would not allow Spectre to do that, by defeating him, which amused Spectre. Blue Angel started her turn by summoning two "Trickstar" monsters, and played "Trickstar Light Arena" to prevent Specter from activating his Set card, and brought out "Trickstar Holly Angel". Spectre noted its effects can damage him and strengthen "Holly Angel", as Blue Angel noted being too popular had its drawbacks. She revived "Trickstar Lilybell" and inflicted 200 LP damage on Spectre. However, she saw the tree started reacting, but Spectre ordered her to continue. "Lilybell" attacked Spectre directly, who announced his tree's effects have been triggered - Spectre Special Summoned a Link Monster, "Sunvine Gardna", which restored Spectre's LP back. Spectre took note that Blue Angel drew inspiration from the book named after her. Spectre admitted it was a good book, and read it out loud, claiming the character, "Blue Angel", shared the traits of Skye Zaizen herself. He continued reading, pointing out that Skye Zaizen also feels lonely and cries. To prevent that, Spectre knew Skye Zaizen became Blue Angel, a hero of LINK VRAINS, to become popular. Blue Angel was angry Spectre dug up her past, who was nevertheless amused. Blue Angel identified him to be like the evil monsters in the book, as a "sad excuse for a human". She swore to defeat Spectre, who claimed it would be an honor. "Holly Angel" attacked "Sunvine Gardna", who protected Spectre by reducing 800 LP damage from that attack, as well as ending Blue Angel's Battle Phase. Blue Angel realized Spectre played a defensive Deck, who boasted it is an absolute defense. Blue Angel ended her turn with a Set card, while Spectre belittled her efforts. Blue Angel planned on using "Trickstar Reincarnation", which would make Spectre draw 5 cards and two of her "Trickstar Lycoris" would inflict 2000 LP damage on him. His Set card, "Sunvine Burial", banished Blue Angel's "Trickstar Reincarnation" and all of her copies in her Deck. He predicted Blue Angel would use that to inflict a lot of damage on his LP through "Lycoris". Spectre claimed he opened Blue Angel's heart, finding that loneliness when Skye was six years old, after the disappearance of her parents, soothed down when Akira read the "Blue Angel" book to her. Seeing Akira is her "treasure", Spectre knew Skye fears losing that "treasure" the most. He proclaimed Blue Angel would lose everything, after she loses to him in this Duel. Spectre drew a card and was inflicted 400 LP damage, and used "Sunavalon Dryas" to bring out "Sunvine Healer", which restored his 500 LP back. Using "Spectre Healer", Spectre's "Sunavalon Dryas" evolved into "Sunavalon Dryades", a Link-2 tree. He noted like Akira protects his sister, this tree protects Spectre. Blue Angel sensed Spectre was also alone, since he loved the book, but unlike her, he was not loved and became destructive, which is the source of his power. Spectre found Blue Angel a strange person to have noticed his traits. Still, this made to him clear that Blue Angel knew her purpose, and found it bad that she would not live up to that. He brought the "Sunseed Genius Loci", using it to Link Summon "Sunvine Slasher", whose ATK was boosted to 2400. "Sunvine Slasher" destroyed "Holly Angel" in a double K.O., but Specter revived the latter to "Sunavalon Drydes'" Link Marker. "Holly Angel" destroyed one of Blue Angel's "Trickstar Lycoris", and Spectre asked her how did it feel to be attacked by her own ace monster. Blue Angel wondered if there was a way to destroy his tree, and upon looking at her hand, found a new strategy. Blue Girl and Ghost Gal successfully managed to enter the unknown world through the portal, where they were met by strong winds. After being nearly brought down, both of them land safely, only to find the emergency signal from the missing research team. As they reached the cave originating the signal, they found the unconscious researchers. Blue Girl suggested they could rescue them by using their emergency evacuation program, but that would require using both Emma's and Skye's, and the the former wasn't willing to do it. Blue Girl then explained how she couldn't leave them behind, since her previous defeats only showed how much of a child she still was, forcing others to always save her, and for that reason, she couldn't allow herself to leave others behind. With that reasoning, Ghost Gal accepted using her program as well, logging out both researchers. After leaving the cave, they managed to travel safely through the winds, until it suddenly stopped blowing as Playmaker and Soulburner reached them. Upon making contact with the two, Blue Girl presented herself Blue Angel. Soulburner was happy to meet another savior of the old Link VRAINS, but Blue Girl stated they were actually seeking to retrieve the Ignis. While both Playmaker and Ghost Gal were willing to solve the situation without Dueling, Soulburner accepted Blue Girl's challenge. Determined to overcome her previous defeat against Specter, Blue Girl improved not only her Trickstar Deck, but her thought process as well. From the very beginning of the Duel, she was ahead of Soulburner's every move, using "Trickstar Divaridis" to damage him each time he Summoned a monster, "Trickstar Calobane" to compensate for her monster's lower ATK, and "Trickstar Lycoris" to immediately cause Soulburner to lose the Duel if he used his Skill, Burning Draw. Using her new Skill, Trickstar Gig, Blue Girl added "Trickstar Fusion" to her hand and Fusion Summoned "Trickstar Band Sweet Guitar", launching a final attack against "Salamangreat Heatleo", but Soulburner still managed to survive. Despite not being able to finish him, Blue Girl was confident she would win in her next turn, and returned "Calobane" to her hand considering Soulburner's only option would be attacking her. However, he was able to use his Skill to draw "Fusion of Fire", fusing "Heatleo" and Blue Girl's "Divaridis" into "Salamangreat Violet Chimera". When "Sweet Guitar" and "Violet Chiemera" battled, Blue Girl used "Trickstar Calobane" once again to reduce the damage she would take, but Soulburner countered with the effect of "Violet Chimera", doubling its ATK when battling a monster whose ATK was also modified, winning him the Duel in a single hit. Soulburner then approached Blue Girl, complimenting her for becoming much stronger, before forcing her to log out. Skye and Akira are step-siblings. Akira cares very deeply for Skye due to their parents dying while they were young. Skye, on the other hand, is shown to have a big brother complex and idolizes him. Akira is aware that she is Blue Angel, but fails to see her desire to gain recognition from him. Akira unknowingly neglects her due to him working to ensure she doesn't have any hardships. However, Akira has shown that Skye is more important than his work as he risked his position to find a cure for her. He also seems protective of her, as seen when he questioned Yusaku about their relationship, or when he confronted Varis for the removal program. 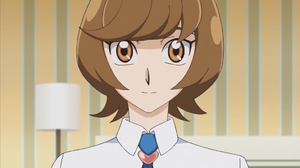 Skye and Yusaku are classmates, but only Yusaku is aware of her alter-ego. 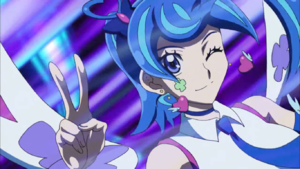 As "Blue Angel", Skye is shown to develop an interest in Yusaku's alter-ego, "Playmaker", after he saved her from a "Cracking Dragon". She is shown to be grateful to "Playmaker" for saving her, and saved him in return after he fell from his Duel Board. She also has a desire to defeat him in a Duel to prove herself. 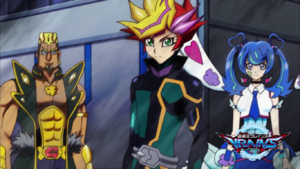 Yusaku is interested in getting close to Skye in order to obtain leads regarding SOL and his fight against Hanoi, but Skye assumed that he, like many others, wanted a new Duel Disk or a job at SOL so she quickly dismissed him. Yusaku was shocked when he discovered that Skye may have ties to the Knights of Hanoi showing that he never thought of her as enemy, but he was still willing to duel her. He was visibly disturbed when Hanoi's card began damaging Skye so he rushed to end the Duel as quickly as possible, out of concern for her well being. After the Duel, Yusaku felt it was his responsibility to help Skye recover from her coma and willingly walked into a trap set by Ghost Gal for the sake of saving her. Yusaku's defeat of Varis allowed him to obtain the removal program which he used to awaken her. Following his Duel with Varis he immediately asked Kolter if Skye was alright. 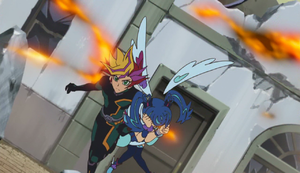 After Skye's recovery, Yusaku is shown to still be concerned about her safety and worried that she hadn't attended school for a long time. Ai also teases him for being worried about her. After hearing about Yusaku's traumatic past, Skye felt a great feeling of sympathy for him. As Blue Angel and Blue Girl, Skye uses a "Trickstar" Deck that focuses on inflicting effect damage in small increments; Ai describes her Duel style as "poking with needles". Her main strategy is to first gain card advantage while Summoning multiple "Trickstar" monsters, then inflict effect damage to the opponent multiple times a turn, often using "Trickstar Lycoris" and "Trickstar Light Stage", and powering up "Trickstar Holly Angel" at the same time. Her Skill, "Trickstar Trick", plays into this combo, as it forces the opponent to draw cards and triggers the effect of "Lycoris". During the second season, Skye's Deck strategy changes subtly. In addition to her previous strategies, she also focuses on recycling tactics, using cards such as "Trickstar Fusion" and her new Skill, "Trickstar Gig" as well as incorporating Fusion Summoning into her Deck. As Blue Maiden, Skye plays a "Marincess" Deck that was provided to her by Aqua. The Deck focuses on boosting the ATK of her WATER monsters while also creating a steady defence with her Trap Cards that can be activated from the hand and have additional effects the higher the Link Rating of the Link Monster Skye controls is. ↑ 1.0 1.1 1.2 Yu-Gi-Oh! VRAINS episode 18: "Dueling for Answers"
↑ 2.0 2.1 2.2 2.3 Yu-Gi-Oh! VRAINS episode 7: "Fallen Angel"
↑ 5.0 5.1 5.2 5.3 5.4 Yu-Gi-Oh! VRAINS episode 6: "True Blue"
↑ 6.0 6.1 6.2 Yu-Gi-Oh! VRAINS episode 25: "Suture the Circuit"
↑ 7.0 7.1 7.2 Yu-Gi-Oh! VRAINS episode 2: "Seize the Wind!" ↑ 8.0 8.1 8.2 8.3 Yu-Gi-Oh! VRAINS episode 33: "Blue Tears"
↑ Yu-Gi-Oh! VRAINS episode 28: "Bugging Out"
↑ Yu-Gi-Oh! 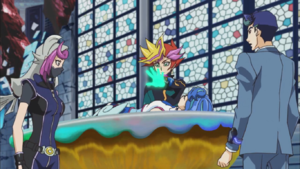 VRAINS episode 32: "The Tower of Hanoi"
↑ Yu-Gi-Oh! VRAINS episode 55: "To the Unknown World"
↑ Yu-Gi-Oh! VRAINS episode 56: "Blue Girl's First Battle!" ↑ This card is given to Aoi by Spectre in episode 6.